I’m still in the countryside of Northern France, for another couple of days. The sun finally came out after a whole week of rain, so I was able to go out and take long-delayed pictures of some recent, and not-so-recent projects. Here’s the first of them. The design is very simple, great for a beginner to become more confident with his/her hook. You can find it on the Lion Brand website, for free. I remember finishing it on the train to my parents’ in April, as I wanted it to be as large as possible and thus pushed the finishing line to as late as possible; but as I’d forgotten to take my camera, I wasn’t able to take pictures of it when I gave it away – and consequently didn’t blog about it until now. Lastly, for the fans of P’tite Mignonne out there, here are a few pictures of her holiday in the Alps. 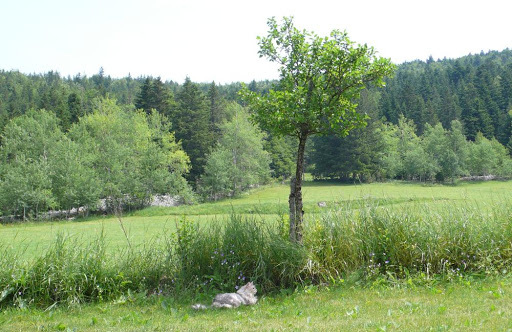 The place where we stayed was very kitty-friendly and had a huge garden/field, so she had a grand time – and was quite the star among our co-vacationers! P’tite Mignonne doesn’t mind travelling at all as long as she can see/feel me, and it’s wonderful to have her share in the holiday fun. To be honest, I was sicker than her in the coach driving the last few miles – she was purring away in my lap while I was struggling to make it to destination without puking like a kid. 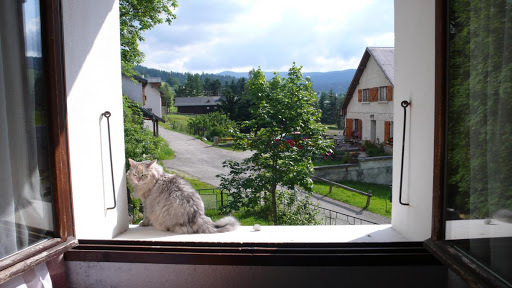 😀 She’s been to so many places both in France and abroad – London, Amsterdam, and various counties in France – that she must be one of the best-travelled cat in Europe. 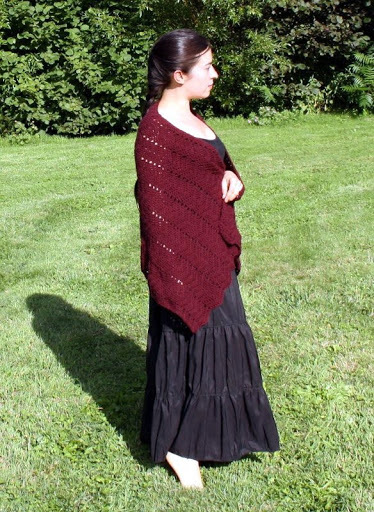 That is a beautiful shawl! I know it is special for your Mom as you made it. Loved the kitty pictures.She always looks so relaxed. We were in British Columbia (western Canada) for a week and our kitty was so glad when we got home. He followed us around the house for two days just to make sure we were still there. Thank you, Donna! You don't seem to have a blog where I can post so I'll reply here. Your own story about your cat made me chuckle. 🙂 They sure have a way of making themselves understood, don't they! That is a lovely shawl. I'm sure your mother loves it. You might be surprised by the number of cats who travel. We used to breed and show pedigreed cats and our regional/national winners would always have over 10,000 airline miles before their year was done. I have been to cat shows in England and Australia, so I know those cats travel, too. Still it is nice to bring your best friend with you. Ce châle doit être bien douillet. 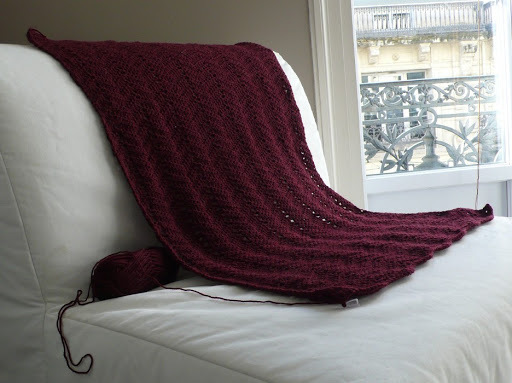 mais 9 pelotes et tu n'as pas trouvé le temps long à crocheter une si grande pièce? très beau travail pour ta Maman, bravo, que d'heures de passées!!! Ptite Mignonne porte bien son nom sur ces photos, elle est juste contente d'être avec…. Your mums shawl is beautiful! Your travel pictures are too. It's nice that you can travel with P'tite Mignonne. What a stunning shawl for your mother. Hard to believe you were a beginner when making it. Sounds like you had an amazing time on your vacation in the alps. What a great way to rest and relax and prepare for the new school year. Enjoy the remainder of your vacation. I've enjoyed seeing the pictures from your trip. Such beautiful countryside! It is similar, but not quite the same, as the Northern Rockies near where I am. And it is so difficult to capture that sense of vast space in a photo, but you've done a great job with yours! 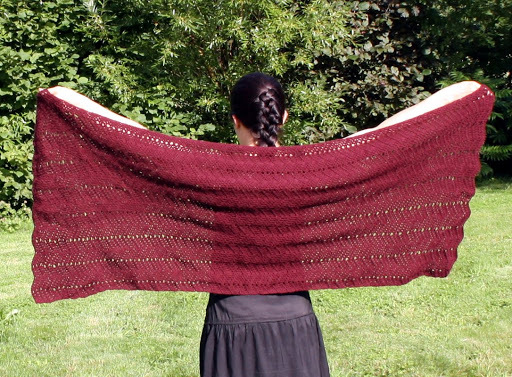 The shawl is beautiful, and the area looks just lovely! It's easy to see that P'tite Mignionne loves it! 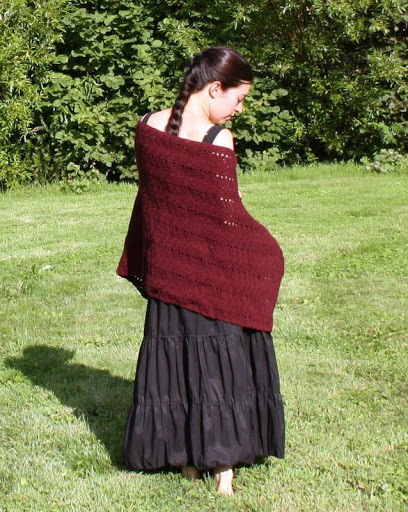 Beautiful shawl – stunning color! And of course, I always love kitty photos! She is one beautiful cat. D'abord, félicitations pour ce châle que je trouve splendide ! What a lovely shawl!! And I'm glad that P'tite Mignonne travels so well! Oh that shawl is beautiful!! I'm crocheting a version right now in Kauni wool. Yours is inspiring!